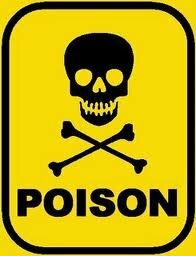 SPECIAL ALERT … NEW TOXIN!! This new super poison has allegedly killed one of the Westminster competition dogs, a Samoyed. Please be aware that two possible events occurred: (1) The dog found it in a motel room or (2) someone poisoned the dog at the dog show. For those of you that travel with your pets and kids … this is a very serious implication. 2008 EPA Regulations May Have Unintended But Dangerous Consequences. Fluffy got into the rat poison in the garage? Get the Vitamin K! Not so fast, warns Ahna Brutlag, DVM, MS, a diplomate of the American Board of Toxicology and assistant director of veterinary services for Pet Poison Helpline. The ingested substance may be bromethalin, the new toxin of choice for rodenticide manufacturers. There is no test save necropsy to detect its presence–and no antidote. Why are manufacturers switching to bromethalin? Because in 2008 the U.S. Environmental Protection Agency (EPA) issued a decision prohibiting the use of second-generation or long-acting anticoagulants in residential settings. Manufacturers became compliant with these new regulations in 2011, with many using bromethalin instead of anticoagulants in their products. Brutlag says the EPA’s changes–designed to make rodenticide safer for children, pets and wildlife–may actually make diagnosing and treating rodenticide poisoning more difficult, thereby increasing the risk of harm. “We feel like it was well-intentioned but we’ve ended up with some really frightening consequences,” Brutlag says. “With anticoagulants at least we know there is a very effective test and there’s an antidote.” Bromethalin is a neurotoxin that affects mitochondria in the brain and liver. According to the Pet Poison Helpline, it results in decreased ATP production, which affects sodium and potassium pumps; as a result, lipid peroxidation occurs, resulting in sodium accumulation within the cell. Edema of the central nervous system (CNS) may result. The rapid onset of bromethalin poisoning leaves veterinarians little time for error. “The symptoms come on faster and it’s harder to treat,” Brutlag says. With anticoagulant poisoning, veterinarians had three to five days before bleeding began–maybe a week before death. But with bromethalin, clinical signs associated CNS edema may be seen within two to 24 hours. Once the animal starts showing neurological signs–CNS stimulation or depression, abnormal behavior, ataxia, hyperesthesia, seizures, coma–successful treatment becomes more difficult and more expensive. An animal may have only a couple of days before succumbing. Even in successful cases, Brutlag says treatment requires more emergency care and hospitalization. “Since there’s no antidote, decontamination is the most important intervention,” Brutlag says. But she worries that not enough veterinarians are familiar with how to decontaminate bromethalin exposure. According to the Pet Poison Helpline, the median lethal dose (LD50) of bromethalin for dogs is 2.38-3.65 mg/kg, with a minimum lethal dose of 2.5 mg/kg. Cats are more sensitive, with a significantly lower LD50 of 0.54 mg/kg. Severity is dose-dependent, but if the poisoning is discovered within 10 to 15 minutes of ingestion, it’s safe to induce emesis at home, Brutlag says. After that small window, induction of emesis should take place at a veterinary clinic where the animal can be monitored for acute onset of CNS signs and be given multiple doses of activated charcoal–four to six doses over 24 hours. “Should clinical signs arise, patients are treated with standard measures to reduce cerebral edema including IV fluids, mannitol, etc.,” Brutlag wrote in an impact statement for the EPA. Prognosis is poor for patients exhibiting persistent seizures or paralytic syndrome. As a legal assistant specializing in personal injury law for the past 27+ years, I’m acutely aware of bad driving practices on the road. Without fail, injuries are caused because someone wasn’t paying attention to traffic patterns, road conditions and/or traffic signals. Short of a boulder falling off a mountain, there are no “accidents” when it comes to people, vehicles and inattentive driving. It literally takes just the blink of an eye to change someone’s life and health forever. While running errands yesterday, I saw several vehicles with dogs riding in the front seat next to their owner or pacing the full length of the back seat. And — I have to admit — I’ve been known to toss a dog on the front seat and make the straight-shot, 5-minute drive to my vet/grooming facility. However, after watching the slow motion videos from the Center for Pet Safety, that practice is hereby discontinued. Permanently. These videos are part of a study on pet restraint systems and how effective they are in an automobile collision. Now imagine a dog with no restraint system in a collision. Imagine a small dog on the front seat with airbags deployed (at 200 mph) in a collision. 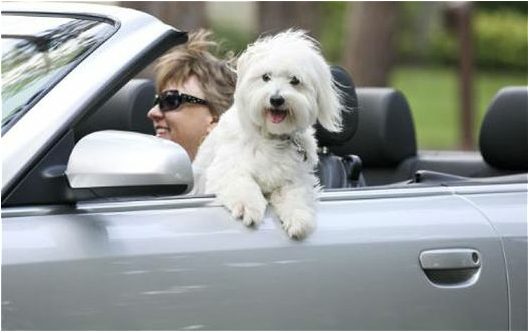 Imagine a dog hanging over the door as in the above photo (convertible or not). From here on out, my dogs will always ride crated in the back of the vehicle with the crate secured in some fashion … no matter how short the trip. Colorado, like the majority of the country, has had miserably hot temps which arrived in early spring. Given the weather patterns so far, I’m sure it will remain quite warm well into September. This post is prompted by the number of people I see out walking their dogs in the afternoons here lately. 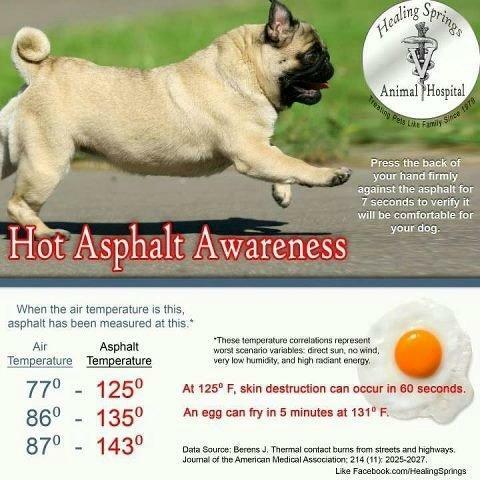 Rule of thumb, folks — if you can’t walk barefoot on the concrete or road surface due to the heat, neither should your dog!! 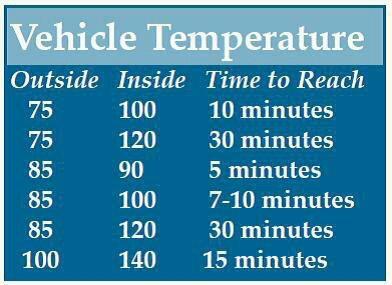 I did some checking and found this handy-dandy asphalt temps guide which notes that while the air temps might be tolerable, the pavement is much hotter than one would expect. If you simply must walk your dog, please do so in the early morning or late evening when the ground surfaces have had sufficient time to cool down. And while you’re at it, don’t forget the mosquito repellent. Living in Larimer County where we had a severe outbreak of West Nile several years ago, one must always be aware of the danger of contracting West Nile (I, personally, know four people who have had it to varying degrees). Since we’re on the subject of hot summers, let’s not forget how quickly car temps can heat up with moderate temps … for dogs and little humans alike. Keep it safe … keep it sane … and keep your dogs home out of the heat! Jackson came to rescue in 2009, a casualty of the down turn in the economy. His owner now worked two jobs and no longer had the time or funding to take care of him. Giving him up was very difficult as the owner had planned to begin training to make him a therapy dog. Fostered by Michelle in Wellington, Jackson’s stint in rescue was a relatively short one. Linda first met Jackson at the Fort Collins Fire Hydrant 5 where we had a rescue/breed booth set up … and where she was immediately smitten with this little dog. 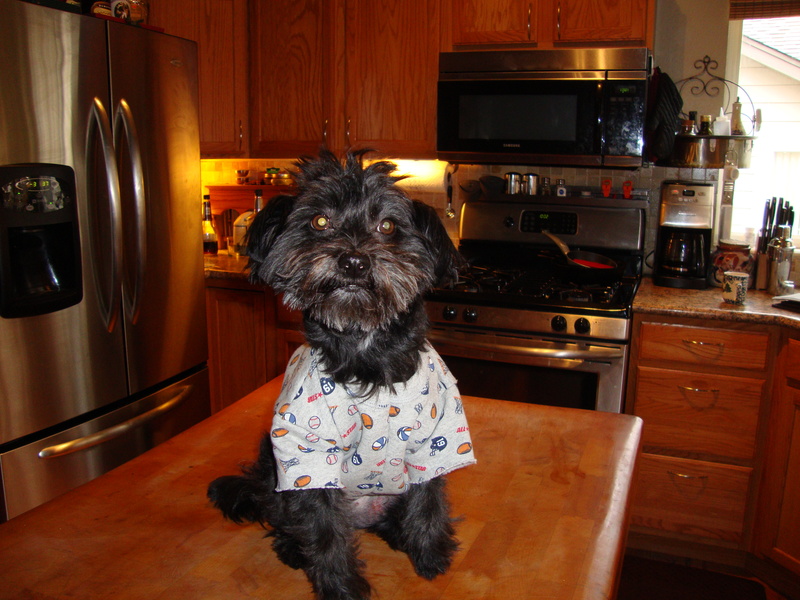 Shortly thereafter, in May of 2009, Linda and Troy added Jackson to their family. 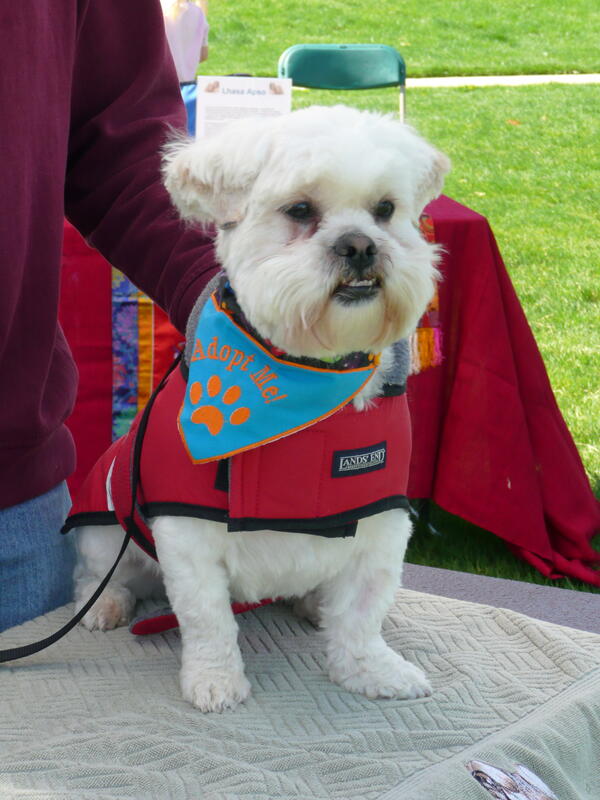 As Jackson was such a nice little dog and didn’t know the word “stranger,” Linda took on the owner’s goal and they became certified as a therapy team. Linda later fostered Jasper for us and we got to see her and Jackson on numerous occasions as time went by. Jackson was one of those dogs whose face exuded joy. No matter the circumstance or the activity, he was a happy dog, his eyes a sparkle. This was harder than I thought. Jackson was put to sleep on Thursday night. He had an autopsy at CSU and then cremated. He is still sitting on our counter and I’m not sure why? Anyway it was a FCE. An embolism. A piece of spinal cord broke off, traveled through a blood vessel and went back to the spine. By the time it lodged, much of the spinal cord had blown. Meaning, the paralysis would have eventually gone to the sternum and suffocated him. There was nothing to do. Pretty rare for a small dog, but the age group was right. He was filmed by CSU through all this is and will be immortalized by teaching vets about this. I’ve attached some photos of the boy. He was truly special and we are a little lost without him. We were honestly loved by Jackson. As pet owners, we all know that life is transient with our beloved companions. We watch as the years tick off, collecting vignettes in time from which to draw upon for comfort when we have to let them go. However, I don’t think any of us can steel our hearts for the untimely loss of a healthy, young dog. Linda mentioned to me in a phone call how fitting it was that this therapy dog in life would — in death — go on to teach the healers among us. Jackson’s cremains will be interred in the family plot at some point. For now, and for as long as it takes until that happens … he’s home. And I know, without a doubt, that this would have been Jackson’s last Will. Godspeed, little one. It was an honor to have been a part of your life. As my former rescue partner can attest, it never fails that rescue emergencies arise when we’re out of town or getting ready to leave town … my recent trip to San Antonio was no exception. In day four of the trip, I get an email about an Apso mix in the Canon City shelter who needs to be transported to a rescue NOW or face euthanasia. A flurry of emails and phone calls ensues; she’s being transported on Thursday to Denver for pick-up at 12:30 p.m. Great. My first day back at work and there’s no freakin’ way I can meet the transport at that time. Recalling Kirby’s family said, “If there’s anything we can do …”, I make a call with fingers crossed. Kay, ever so gracious, interrupts me pleading my case by saying, “We can go get her!” Not only did they go get her, but they also set about to get her cleaned up with a bath upon their return home. And then offered to foster her when it became readily apparent she was a very sweet girl. What a blessing for both “Tootsie” and rescue! Tootsie actually arrived with the name of “Stubbie” … she’s missing her left front paw. Given what I know of anatomy and as confirmed by Doc Sherry, the missing paw is genetic in nature. In any event, she gets around quite easily and even navigates the doggy door in the foster home. After much discussion between two vets and two groomers, we’ve come to the conclusion she’s an Apso-Yorkie mix. From her transfer paperwork and the various emails with the shelter in Canon City, it appears she was a transfer in from a shelter in New Mexico. Quite the traveled little dog! She underwent a spay about ten days ago and is healing up quite nicely. We opted for the laser treatment on the incision — something new at the clinic — which was touted as promoting faster healing. By all accounts, it is doing just that. Anything that can help them heal faster is definitely worth the extra $15. The day after her spay, we got an email saying that one of the other dogs on the transport had come down with parvo. Definitely not someplace we want to go! Although Tootsie had a parvo vacc at the shelter in April (probably her first ever in her short life), we scrambled and got her in for a quick booster per Doc Sherry’s recommendation. Tootsie is a sweet little dog. She is very much attached to her foster family and plays with the other dogs in the house. A quick study, she’s picking up very quickly on the housetraining and sleeps the night through in her crate with nary a peep. She would probably do best in a home with adults and one other dog. If interested or would like more information on her, please contact me at: ApsoRescue@aol.com. 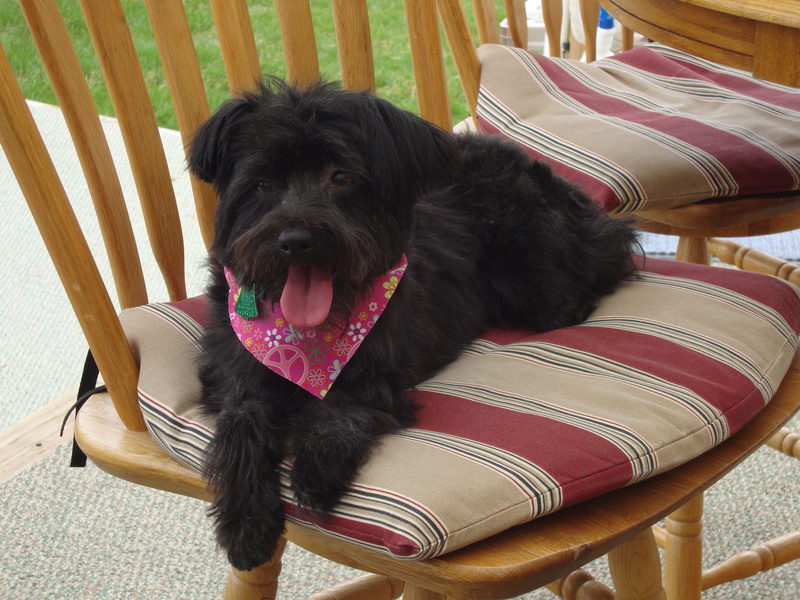 Tootsie is about as loving and low-key as they come … just a great little dog. In a phone conversation with Kay, she mentioned that while one initially feels sorry for Tootsie and her obvious disability with the missing paw, one quickly realizes that she has known nothing else so her life is “normal” … she gets along just fine, thank you, and does everything that a dog with four paws can. Petfinder.com Foundation furnishes funds to protect rescue dogs from canine flu. 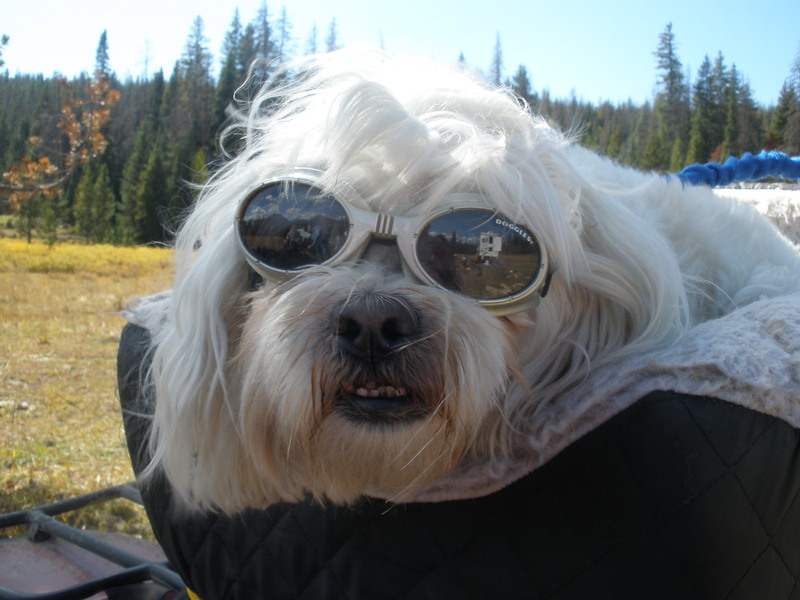 TUCSON, April 2, 2011 – American Lhasa Apso Club Rescue – Colorado now has help in protecting dogs against canine influenza virus (CIV), a highly contagious disease that spreads easily from dog to dog, especially those in close proximity. The rescue received a grant for the vaccines as part of a Petfinder.com Foundation program to build community immunity against this respiratory infection. The foundation partnered with Intervet/Schering-Plough Animal Health, a global animal health company and makers of the NOBIVAC(r) Canine Flu H3N8 vaccine, to fund the grant. Dog flu is a growing problem throughout the U.S. It has been confirmed in 35 states so far, but tracking the disease is hard because it is so difficult to diagnose. Dogs are contagious before they show any symptoms. By the time the dog starts coughing, it’s too late. Virtually all dogs exposed to the virus will become infected, and some will get more serious infections, such as pneumonia, which can be fatal. Dogs that go to doggie daycare, boarding facilities, groomers and shows and are vaccinated for canine cough (Bordetella) are also at risk for canine flu. Information about canine flu is available at www.doginfluenza.com. Our thanks to Petfinder and Intervet/Schering-Plough Animal Health for awarding us this grant! We know that CIV has already arrived in Colorado. Dogs contracting CIV become sick very quickly and require immediate medical attention. … when it’s time to let a beloved companion go? As pet owners, we must all face this difficult decision if we are to keep the promises made long years ago. To keep them safe, to keep them warm, to keep their best interest at heart no matter how difficult. Whether it’s the first time or the fifth time, it never gets any easier. Today’s post is more for me than anything else. We’re struggling with the question of euthanasia for our old girl, Ali. She has severe OCD (obsessive-compulsive disorder) that’s bordering on self mutilation. She’s always had some element of OCD but it has become markedly worse in the past year. Nothing we’ve tried in the past or the present has helped to a great degree. The current medication as prescribed by a behaviorist from CSU is losing its efficacy. She’s miserable — we’re miserable. As a self-admitted control freak, it is exceedingly difficult for me to concede that I can’t “fix” this. No matter what happens, I do not want to look back on this time and say, “I waited too long” as that means the dog has suffered. Needlessly. Dogs are not people. We lovingly anthropomorphize our dogs during our time together and there’s no harm in that, even quite a bit of reward for both them and us. But the bottom line is that they are not people and they don’t think in the way people think. (Many of us would argue that that speaks to the superiority of dogs.) These amazing beings love us and trust us implicitly. It just isn’t part of their awareness that they should need to telegraph anything to us in order for their needs to be met or their well-being ensured. They are quite sure that we, as their pack leaders, operate only in their best interest at all times. Emotional selfishness is not a concept in dogdom and they don’t know how hard we sometimes have to fight against it ourselves. Dogs also have no mindset for emotional surrender or giving up. They have no awareness of the inevitability of death as we do and they have no fear of it. It is fear that so often influences and aggravates our perceptions when we are sick or dying and it becomes impossible to separate the fear out from the actual illness after a while. But that’s not the case with dogs. Whatever we observe to be wrong with our sick dogs, it’s all illness. And we don’t even see the full impact of that until it’s at a very advanced point, because it’s a dog’s nature to endure and to sustain the norm at all costs. If that includes pain, then that’s the way it is. Unlike us, they have never learned that letting pain show, or reporting on it, may generate relief or aid. So they endure, assuming in their deepest doggy subconscious that whatever we abide for them is what is to be abided. If there is a “look in the eye” or an indication of giving up that we think we see from our beloved dogs, it isn’t a conscious attitude on their part or a decision to communicate something to us. It’s just an indication of how tired and depleted they are. But they don’t know there’s any option other than struggling on, so that’s what they do. We must assume that the discomfort we see is much less than the discomfort they really feel. And we do know of other options and it is entirely our obligation to always offer them the best option for that moment … be it further intervention, or none, or the gift of rest. From the moment we embrace these animals when they first grace our lives, every day is one day closer to the day they must abandon their very temporary and faulty bodies and return to the state of total perfection and rapture they have always deserved. We march along one day at a time, watching and weighing and continuing to embrace and respect each stage as it comes. Today is a good day. Perhaps tomorrow will be, too, and perhaps next week and the weeks or months after. But there will eventually be a winding down. And we must not let that part of the cycle become our enemy. Remember, dogs are not afraid, they are not carrying anxiety and fear of the unknown. So for them it’s only about whether this day holds enough companionship and ease and routine so that they would choose to have those things more than anything else and that they are able to focus on those things beyond any discomfort or pain or frustration they may feel. How great is his burden of illness this day, and does he want/need to live through this day with this burden of illness as much as I want/need him to? If I honestly believe that his condition is such, his pleasures sufficient, that he would choose to persevere, then that’s the answer and we press on. If, on the other hand, I can look honestly and bravely at the situation and admit that he, with none of the fear or sadness that cripples me, would choose instead to rest, then my obligation is clear. Because he needs to know in his giant heart, beyond any doubt, that I will have the courage to make the hard decisions on his behalf, that I will always put his peace before my own, and that I am able to love him as unselfishly as he has loved me.